Cellist Joanne Grant received her Bachelor of Music and Master’s of Music degrees from the University of Alberta and San Francisco Conservatory of Music studying with Claude Kenneson, Bonnie Hampton and Margaret Rowell. Further training was received through the Banff Centre with master musicians, Lorand Fenevich, Thomas and Isobel Rolston, the Hungarian String Quartet and at the Aspen Music School with Claus Adam, cellist of the Julliard String Quartet. Joanne has performed with the Edmonton Symphony, the Berkeley Promenade Orchestra, the Canadian Chamber Orchestra and the Musician’s of the World Orchestra. For many years she was principal cellist of the Lethbridge Symphony Orchestra and the Southern Alberta Chamber Orchestra. As well, Joanne was a founding member and cellist with the professional chamber ensemble Musaeus, with whom she recorded for the CBC and toured throughout much of western Canada and as far afield as the former Soviet Union. Joanne regularly performs as a member of duo Jai with her husband, oboist/composer Stewart Grant, and as a member of Trio les Amies with Judy Hung, pianist and Sophie Dugas, violinist. Most recently, in April 2018, Joanne became a founding member of La Sinfonia de l’Ouest, the new professional chamber orchestra on the West Island. In Lethbridge Joanne taught for 15 years for the University of Lethbridge Conservatory and for the Lethbridge Symphony String Project. In Montreal Joanne has taught for the McGill Music Education department, the Cedar Park Strings Project, and as section and ensemble coach for the West Island Youth Symphony Orchestra. Joanne aspires to the same creativity and love of the cello that she saw demonstrated by her teacher, Margaret Rowell, and to enable her students to play with ease and much joy. 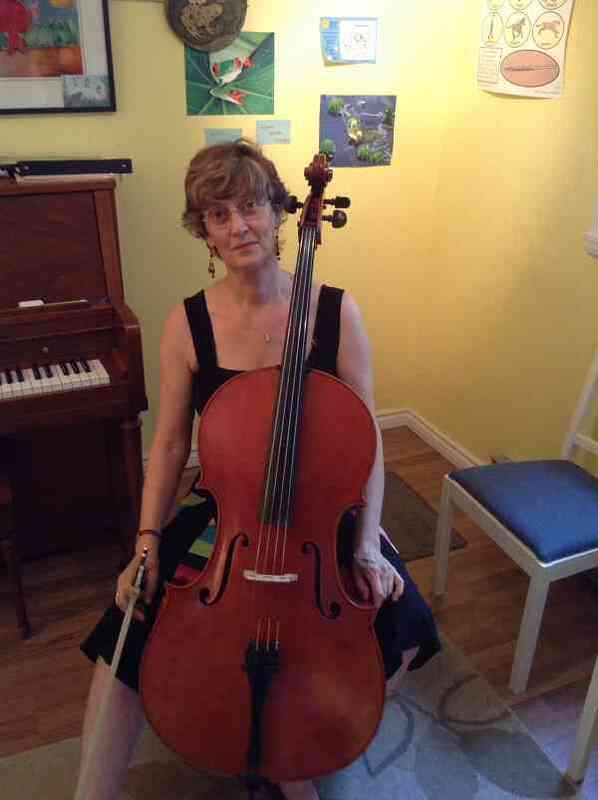 Ms. Grant maintains an active independent teaching studio teaching both Suzuki (bks 1-3, 5,6) and traditional cello. One of Joanne’s great loves is performing group cello literature. La violoncelliste Joanne Grant a reçu sa formation musicale au San Francisco Conservatory of Music et à l’Université de l’Alberta. Elle a aussi poursuivi des études au Centre Banff, au Festival Aspen et comme membre de l’Orchestre national des jeunes du Canada. Membre fondateur du Relevé String Quartet, elle a joué avec l’Orchestre symphonique d’Edmonton, le Berkeley Promenade Orchestra et l’Orchestre de chambre canadien au Centre Banff. Pendant quinze ans elle a été violoncelliste solo de l’Orchestre symphonique de Lethbridge et du Southern Alberta Chamber Orchestra* et membre de l’ensemble Musaeus, avec qui elle a enregistré de nombreuses diffusions pour la CBC et s’est présentée en tournée dans plusieurs villes de l’ouest du Canada autant que dans l’ex-Union soviétique. Mme. Grant se présente régulièrement comme membre du duo Jaï avec son mari, le hautboïste et compositeur Stewart Grant.